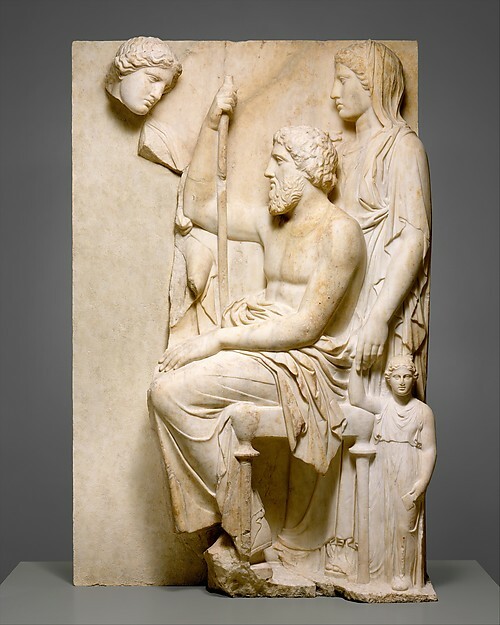 This marble stele is a depiction of a family in mourning, one of whom is the deceased. The stele features an elderly man holding a staff seated at the center of the composition, framed on either side by a young woman. The woman on the right stands behind the figure of a child, who is depicted as a small-scale woman; she is the only figure facing the viewer rather than the center of the composition. The stele’s medium allows for details like the stylized hair of the figures and the defined drapery of their garments. This object is important to art history because of the way it communicates aspects of the Ancient Greeks’ culture surrounding death and bereavement. 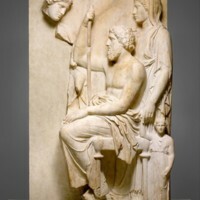 The stele emphasizes family unity by portraying its figures in solemn solidarity: all but the child are gazing at a common central focus, indicating that family connection was revered by the Greeks. It is clear that this culture also valued age and treated the elderly with dignity and respect. This is evident in the seated figure (presumably the deceased) at the center, whose poise and grave expression communicate his status to the viewer. Marble grave stele with a family group would be an excellent addition to the art historical canon as well as to Janson’s History of Art. Currently, this textbook features Grave stele of Hegeso (fig. 5.48) as an illustration of women’s domestic roles in Ancient Greece. This entry also highlights the elements of low relief and blank backgrounds in grave stele. Marble grave stele with a family group both emphasizes Greek cultural practices of aging and death and also displays a well-preserved example of the techniques of the period that produce a naturalistic perspective integral to art history. “Marble grave stele with a family group,” accessed April 22, 2019, http://metsurvey.kenyoncip.org/items/show/15.